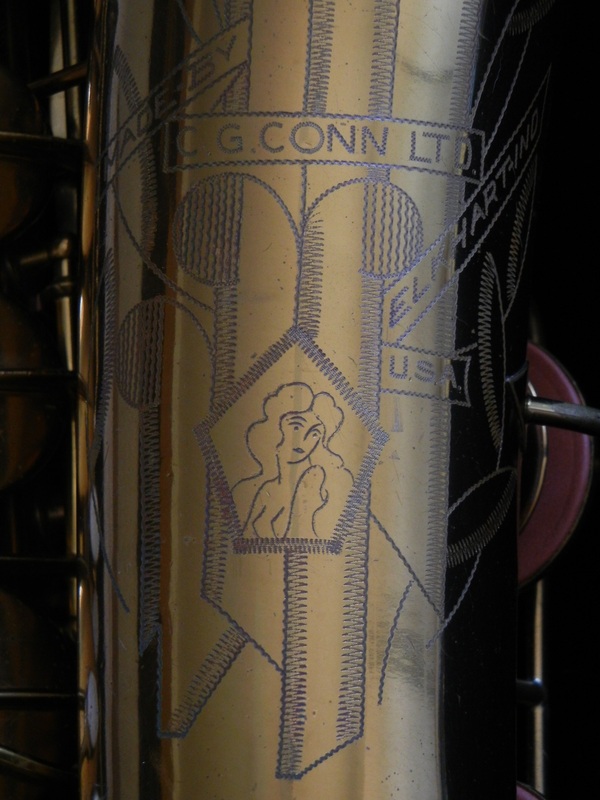 The Conn M-series saxophone, manufactured by C.G. Conn in Elkhart Indiana from 1935 to 1959. In my opinion, one of the most beautiful saxophones ever made, and an example of American design and craftsmanship at its finest. 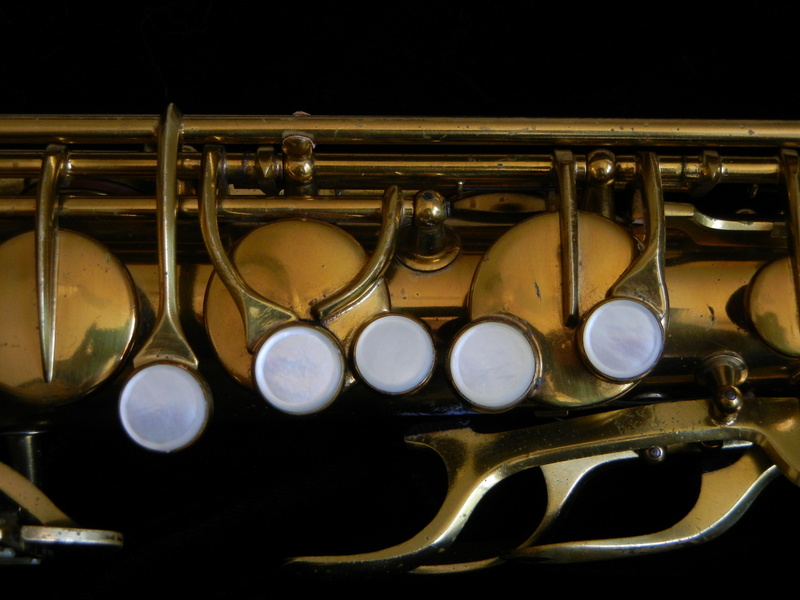 I just finished an overhaul on one of mine (1940 10M- pre-war and rolled toneholes) to go up for sale on my site, and I realized that in particular, there are three parts of the M-series sax that I think are beautiful. Its hard to pick favorites, but when I look at these three particular parts, the seratonin flows. As a repairman, I get to see lots of different horns, and my appreciation for them all is borne out of a love of the saxophone in general, its capabilities, its sound, the story behind its creation and unbelievable eventual success. But some horns just have that something special- something that when looked at in a particular way becomes not just a piece of the saxophone but a piece of art. Here are three such pieces of art. The engraving. What a design. These horns are famous for their engraving, and with good reason. The design is clean, stylistic, memorable, and beautiful. The left hand stack keywork. The shapes here just light up my reward centers. 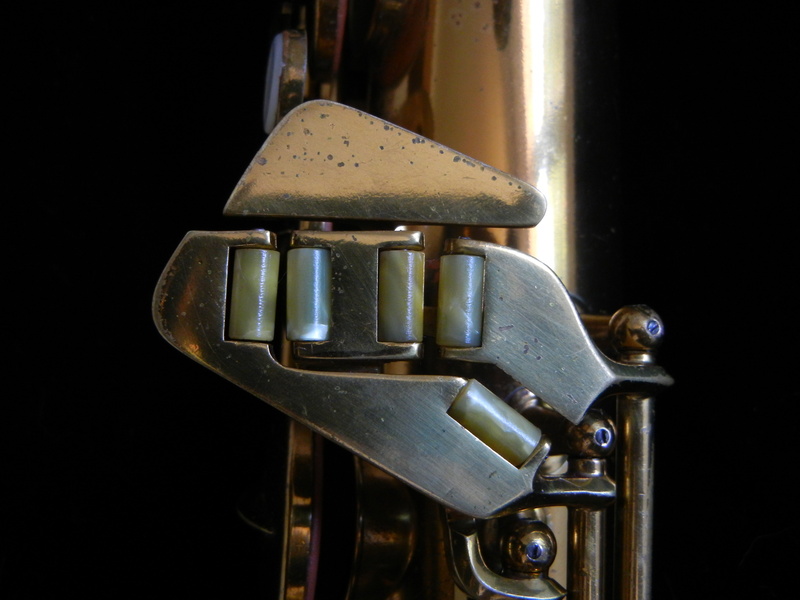 The pearls, when in good shape, are thick and super comfortable and the spacing is among the most comfortable found on any saxophone. Reminds me of a vintage typewriter, or jewelry that a woman in The Great Gatsby might wear. The left hand pinky table. When properly spaced and set up correctly, this design is comfortable, light, slick, and incredibly facile. If you think Conn M series pinky tables are hard to use, you’ve never used one that was set up right. All of the keys move a similar distance in the same direction away from the hand. The shape, while angular, is actually the shape that your pinky makes if your first three fingers are stationary and you try to draw a large circle with your pinky. Try it now- keep your fingers on the “home keys” of your keyboard and draw the largest shape with your pinky that you can. It will be the shape of a M-series pinky table.